Thought this was kinda cool, we got a shout out from Cryptoslate! I’ve been getting contacted from a few different reporters asking about this, and I had no idea such a big investment was coming into the North Country. Coinmint already has a plant set up in the same building we’re located in, but opening one of this scale, bringing in some 150 jobs and $165 million in investment is huge for the area. Upstate NY really needs it too. To set the record straight though, Plattsburgh BTC and Coinmint are not connected at all except for sharing the same warehouse. Right after we moved in! When I started I was surprised that nobody had jumped on it already, as my research showed Plattsburgh had the second cheapest electric in the country and the cheapest on the east coast (#1 being in Washington state of course). With the added benefit of it basically being America’s Siberia, so it’s easy to cool those Antminers. The cheap electric was because of an odd agreement the city of Plattsburgh has, some historically weird thing I’ll try to explain here. This is the general idea but if I have anything wrong let me know. In the past Plattsburgh got ALL of its power from local hydroelectric as there are tons of drain off from the Adirondack mountains and the Saranac river runs through the city, but then there was this huge project to harness the St. Lawrence river, and that could deliver a lot more power. It’s one of the largest hydroelectric plants in NY state. With the St. Lawrence river being so close, we cut a deal with them so they could sell to us for cheap (to entice Plattsburgh to give up its own self-sufficient hydroelectric), and so now all of Plattsburgh’s power comes from the St. Lawrence river locked in to a very low rate. There is a catch though: this is not permanent deal and I think it expires in another 15 years, and the limit is 110 mW. Also, it only applies to the municipality of the city of Plattsburgh (not the surrounding town), a geographically small, almost completely built-out area. Right now about 50 mW of power in the city of Plattsburgh goes to mining bitcoin, possibly more. So about half of the City's power goes to mining bitcoin. And most of it goes to a single warehouse! If I played any role in bringing in some companies to the area with the website/social media, I feel great about that. When I moved into the warehouse, I was the sole tenant on that floor. The area really needs jobs and these are good paying, technical type jobs. The warehouse I started in now has about 6 medium-large scale cryptocurrency mining operations, and with the crackdown in China, South Korea and Venezuela there will be more coming into the area if the demands can be met! I know a few interested parties are looking to bring another 30 or so mW of power online. That's huge, the one in the article is "only" half that. And then there's still lots of latent hydroelectric power to go around. If you are considering, be respectful of the the people, get involved with how things work around here, maybe have your own websites to talk about what you do so people are aware. If we got ASIC suppliers or manufacturers coming to or starting up in the area it could be synergistic to the companies already in place and form a legitimate industry. It could definitely make logistics easier when upgrading to use a local supplier. And don't forget about maintenance! Also, there are no major ASIC manufacturers in the US. Why not Plattsburgh? 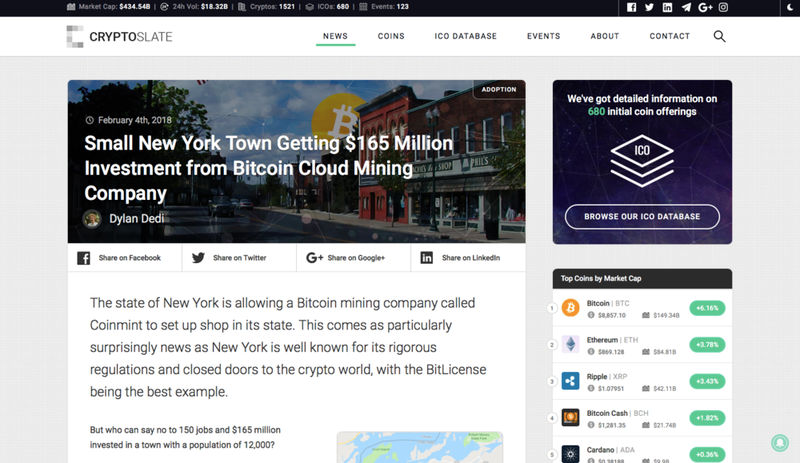 Auxilary industry aside, this is a huge opportunity for Upstate NY. We have some of the best conditions to mine cryptocurrency at large scale in the US.